Imagine yourself in a Florentine museum. You’re walking around in long corridors and big halls, filled with famous works of art by some of the greatest artists to ever have walked this planet. Among these works are many of a religious nature, as the Church has always been one of the most important commissioners of art. You might be walking past these different pieces without too much consideration. Perhaps because they don’t interest you or simply because you didn’t really notice them. And come to think of it, that’s not really that surprising at all. Because those works of art were never meant to be displayed in a museum setting. Their religious meaning and value require different surroundings for their public to fully understand them. And that’s what this Study Day, Sacred Objects in Sacred Collections, is all about. 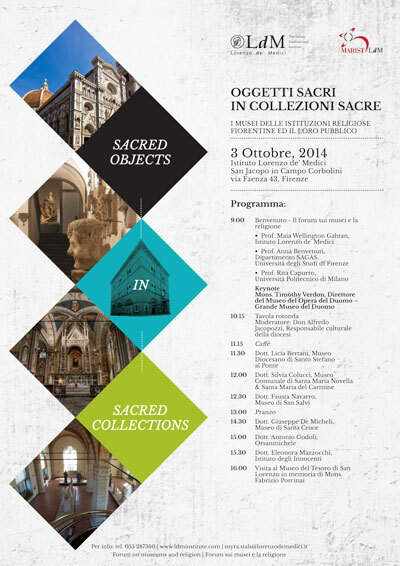 Various speakers representing the museums of different Florentine religious institutions will talk about how their specific museum deals with the particular issues associated with the conservation and display of these kinds of religious objects. The institutions represented are the following: Museo dell’Opera del Duomo, Museo Diocesano di Santo Stefano al Ponte, Museo Comunale di Santa Maria Novella & Santa Maria del Carmine, Museo del Tesoro di San Lorenzo, Museo di Santa Croce, Museo di San Salvi, Orsanmichele, Istituto degli Innocenti. Except for the Keynote Address by Mons. Timothy Verdon, all seminars will be held in the Italian language.